[GW2] Second beta weekend – The things I forgot, a correction and posts by other interesting people. Oh, my! 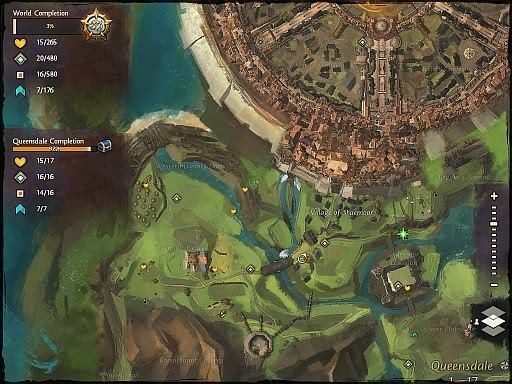 Author RakunoPublished on June 10, 2012 May 22, 2017 13 Comments on [GW2] Second beta weekend – The things I forgot, a correction and posts by other interesting people. Oh, my! *sighs* Even when I try not to rush I keep forgetting things. I even made a grossly mistake too! So here is to address all that! First off, I must apologize for a terrible mistake I did in the "Second Beta Weekend Day 1 – Changes and Additions" post. In there I said that dyes you add to your collection are account wide. Turns out it is only added to the character you used the dye bottle with. I only found that later when I went to play with my coercer. The posts already has been corrected and next time I will try to make sure this kind of glaring error doesn't happen. EDIT: As Syl pointed out in the comments of this post, it might be a bug. I will try to verify that in the next beta weekend and if the same thing happens again I will /bug it. Then perhaps we might have some answer if it is working as intended or just a bug. EDIT #2: As ArcherAvatar pointed out in the comments, the dyes were actually changed to be character bound now. Not account wide. If this situation changes I will point it out in a future post. If it makes it any better, let me point you to the Raging Monkeys blog, where Syl made a post giving a good example of the flexibility of the dye system in Guild Wars 2. Also, I put some screenshots in the previous posts about the second beta weekend. They aren't terribly good I admit and I made the mistake again of not taking as many screenshots as I could. Hopefully I won't make the same mistake in the next beta weekend. Someone who did not make that mistake was Paeroka of Nerdy Bookahs. She took 285 screenshots of the Black Citadel, the charr city, and uploaded the 80 best ones. You can find it here. I don't know if it is just my impression or not but Wayfarer Foothills feels a lot more straightforward to go from one renown heart to the next one compared to Queensdale, the human starting zone. Queensdale they all seem to be more spread out and some times you have to figure out how to get there. Neither is bad per se and there is plenty of exploration opportunities for both. And like I said it might be just my impression. Earlier it wasn't that bad, the red team still held their keeps in the Eternal Battlegrounds map. But the blue team had already disappeared though. Apparently, I wasn't the only one who found myself in a situation like that. Psnacky, author of The Altoholic blog, didn't even have anyone to fight! Anyone has any theory about what happened? Did people from the red and blue teams get kidnapped by aliens so they couldn't fight in WvWvW? Was the PvE content so good people just got distracted on the way to the PvP? Among the changes for this beta weekend was the selection of any utility and elite skills to a tiered system. Previously as long as you had the points you could buy any utility skill you wanted. Now you have to buy a certain amount of skills before unlocking the next tier. 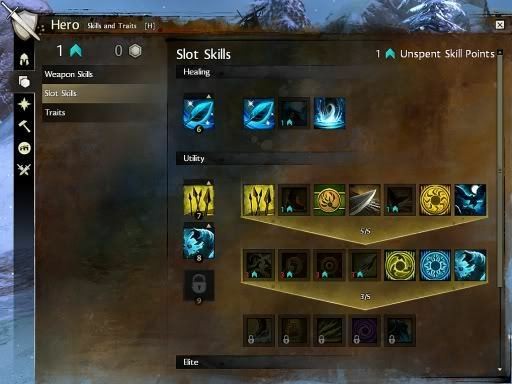 ArenaNet explained the change was so people just don't pick a handful of skills that are "uber". This way they have to have a bigger spread of skills, some that might not look that useful. Some people complained it takes their freedom of choice. Personally, I think it makes things more interesting since you are obligated to buy a certain number of skills before unlocking the next tier, you have to think more which ones you want to keep. In other words, it makes the choices feel more meaningful. Well, I think that is all for now as far as this beta weekend goes. I might try to participate on the big finish event tonight but we'll see! Also I think my plan for all the beta weekends from now on will be to just test the classes. With only five character slots (unless I decide to buy more!) some hard choices need to be made as far as classes go! Of all the game-related cryptic abbreviations I've read, I think WvWvW tops everything! Gah! I thought I wrote the non-acronym part there some where! Sorry! 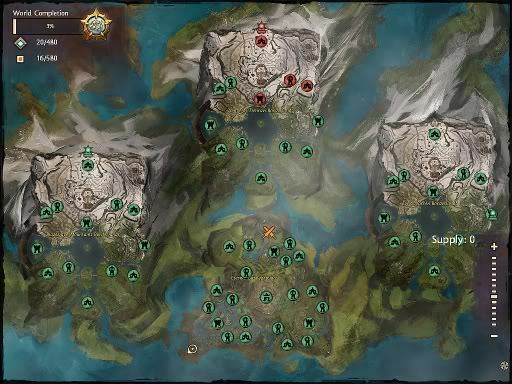 In case anyone else is trying to figure it out, WvWvW stands for "World vs. World vs. World", one of the PvP options in Guild Was 2 where 3 servers fight against each other in a map where they need to conquer territories to score points. I'm not typically a huge fan of PvP in most games, but I really enjoyed the Realm vs. Realm PvP in DAOC (or would it be called RvRvR now? 🙂 ) At least until they nerfed rangers and I didn't have a good character for RvR anymore. GW2 sounds like it might have a very similar system here, so if that's the case, it might end up being pretty fun. I am not a fan of PvP either but there is just something about WvWvW on Guild Wars 2 that I find intriguing. And yes, that is the kind of comparison I've been hearing, that it is similar to Realm vs. Realm in DAOC or some of the PvP parts in Warhammer Online. It's interesting to hear that Foothills seems to be better designed and paced than Queensdale and Ashford maybe, seems many players made similar experiences. And I actually thought as well that dyes were account wide, pity! I did try the one in Queensdale after I made this post but I am not sure if I was doing it right or even if the spot I end up in had the reward. It had something there but unfortunately a bunch of spiders caught up to me before I figured it out. In any case I am afraid the jumping puzzles might be something I will have to skip too since jumping is one of the things I am terrible in any game. Hmmm... Now I am wondering if the first build that we started the beta weekend with the dyes were account wide but then when they brought down the servers for a new build they made it character bound? If so, it would explain how both of us got that impression only to find out later it is not the case. that's where I got it from. maybe it's simply not yet working in the beta? "There was a time when the dye system was very different and at that time dye unlocks were account based, but we have since changed the dyes system and we really feel that character based is the right way to go and the system we have now is the best one for the game. Customized dye should be something that denotes your characters progress, like better looking, more elaborate gear. As you spend more time on your character, they grow and gain access to more customization options. If we make dyes account based, this progression will only happen on one character. We wanted character customization to remain tied to the character but we felt that one-time-use dyes discouraged players from customizing as often as they would like, that is how we arrived at the current system. There are 400 dyes in the game, we do not think of dyes as something that a character should unlock all of, it is not meant to be a collection feature. Each character should have a unique palette and we have made enough colors to make this possible. Dyes come from world drops, rewards, crafting, the Mystic Forge, and the Gem Store and we expect that over the life of a character you will collect a lot of them. We are still developing and the dye system will continue to receive attention and improvements, but changing it to an account based system is not something we are considering right now." Hopefully they will come to their senses on this issue prior to the launch of the game. I am hoping so too. And thanks for solving this mystery for us, ArcherAvatar. Time to edit the posts again! *sighs* So much editing for such a minor issue.... Guess, next time I will check the forums too! I loved the chaos of Queensdale! I even saved it for launch after playing there on the first beta weekend. Which lead me to play in the Charr area an die a lot, like you. Haven't tried it in the past weekend either after the beating I got. Funny thing is I liked the charr area despite all the death I got on it during the first beta weekend. I guess I like the charr that much? I will probably play through it again in the next one to test an elementalist. Hopefully they will have tweaked the area by then.